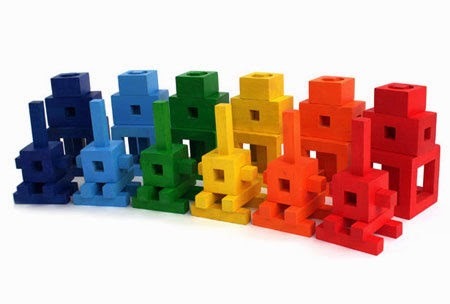 At the Fat Brain Toys, Squigz fall under the "Building and Construction Toys" category but to me, Squigz really needs to have a category all its own. Simply put, there is nothing else like it. I think that is because nothing about it really says "toy" and yet there is no way that it couldn't BE a toy. I think they fall more into the realm of toys that include bubble baths, a pocketful of rocks, a bundle of sticks, empty barrels, and cardboard boxes. It's hard NOT to have fun with those toys, right? 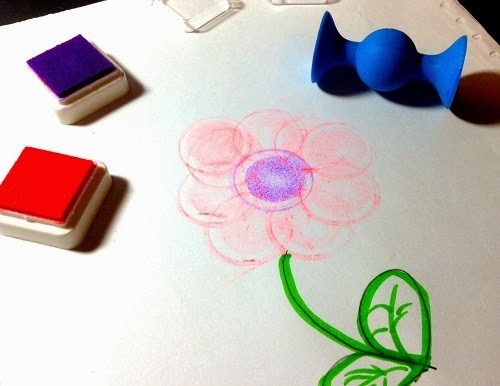 "They are very tactile and attractive for people of all ages," said David Wells, Director of Creative Making and Learning at the New York Hall of Science, the famed children's science museum where the World Maker Faire is held every year. 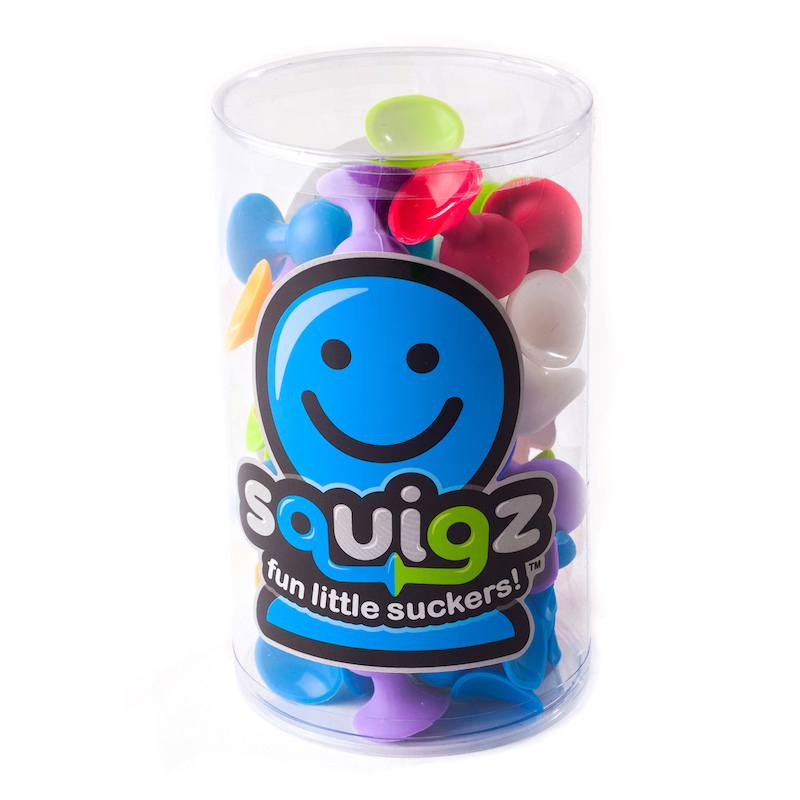 He described Squigz as "visually unique" and "stimulating." David also noted the surprising sound that is made when one pulls them apart. "The seamless combination and activation of these three senses, through a playful activity broadens its appeal." 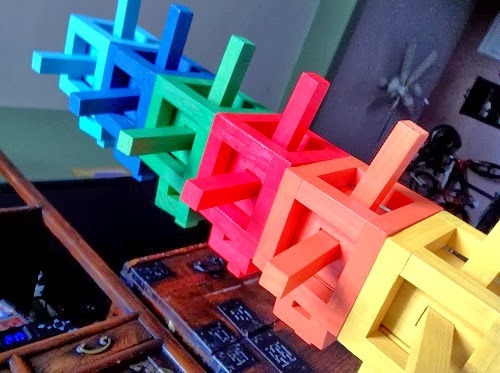 One of our testers (Mr. T) tested the box of 24 and made this sculpture. They have had many roles, fulfilling their jobs until the suction lets go. 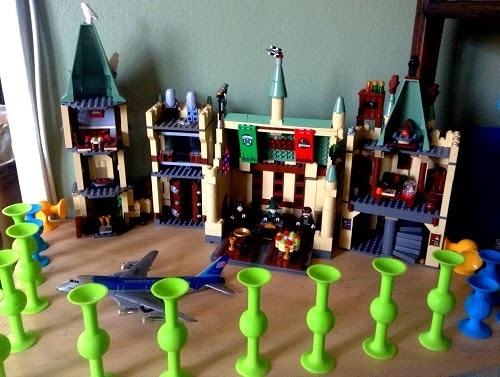 He had fun exploring them as action figures, hooks to securing zip lines, and as weapons for guarding a "jail." These are speed bumps for impulsive kids. 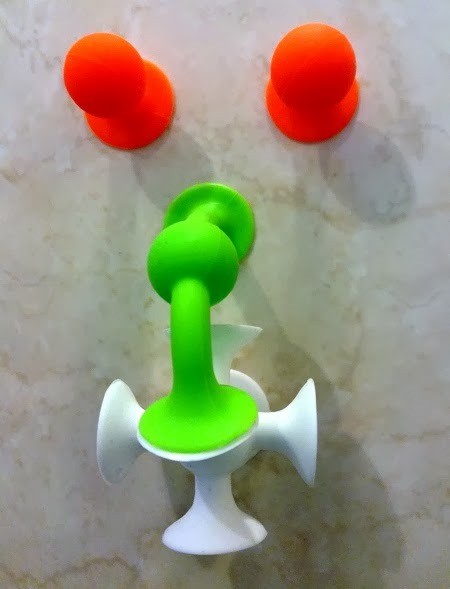 Squigz are a lot of fun in the bathroom too! I love asking David about toys. I always learn so much about learning from him. Thus, I was happy to hear that he actually bought Squigz himself as a gift for a friend's child, a one-year-old. He's not in the habit of ignoring age recommendations but he felt Squigz were something with which a child could grow. 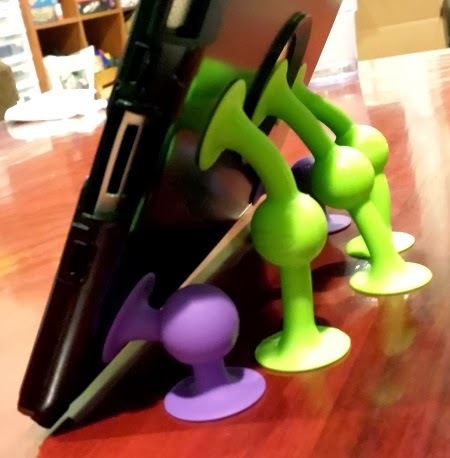 "My friend said it is the best present she got and she is obsessed!" David told me. To be sure, if David Wells sees that there is a toy that a child can grow with, I can assure you, that's a good thing. That's a really good thing. He's reviewed many toys with me and knowing him, I think it is one the highest compliments that he could ever give a toy. Sometimes we make borders- it keeps the junk out of the display area. I love these lime green guys. 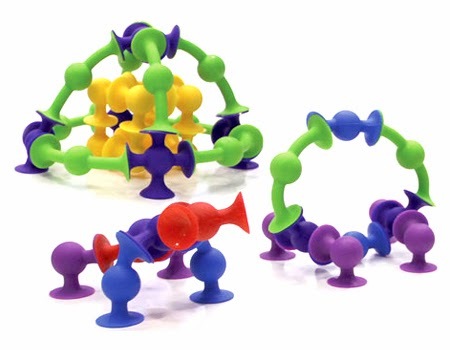 Did you know that you can buy more Squigz as ADD-ON sets? I think ADD-ONs would make great stocking stuffers too! 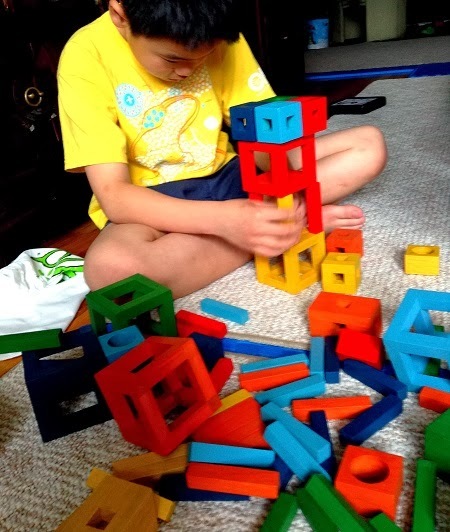 Susan, the super smart OT, put two together, then pulled them apart. They made a loud pop sound and she said, "That's great!" Susan thought this would be a great break activity for homework. 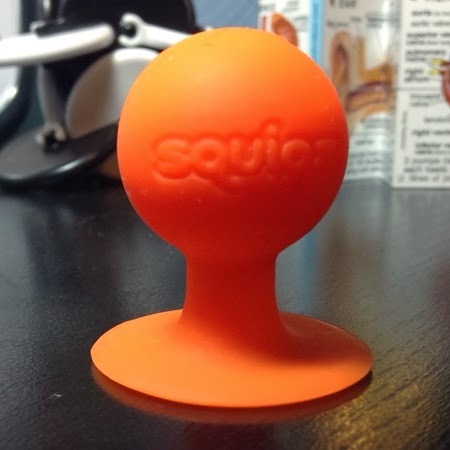 When I look at Pip, the orange Squigz with only one suction cup, I can't help but think of the three jaw chuck. Those who have a workshop know it by the tool name but when pediatric OTs use this term, they are referring to a human's "most mature grasp." 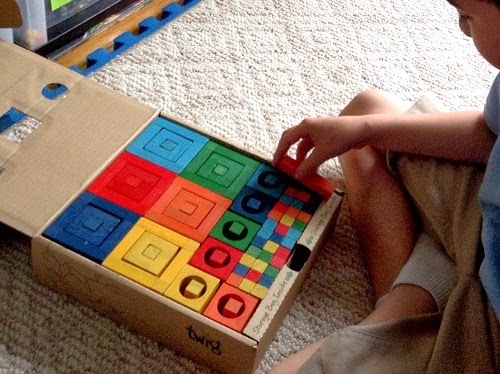 It's basically the grasp that we end up using to write our ABCs. But guess what? When you pick up Pip, Susan said that you'd probably pick up it using that grasp. Why? Well just look at little Pip, how else would you pick him up? (and push him down and yank him out of the suction hold, all the while you are strengthening your hand muscles!!!!!) Wow, that little Pip can do some BIG things! 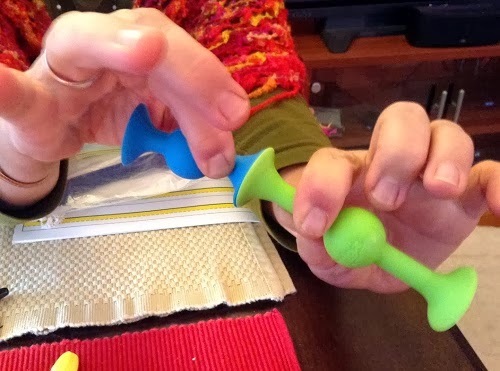 Susan did say that it's okay to explore other grasp positions when you're playing with Squigz because simply put, "We don't want everything tracked to handwriting because not everything is shaped like a pencil." These are the pincer grasps. Kids do this before the three jaw chuck. Can you pull them apart with just this grasp? This is a tough exercise but I would rather do this than sit ups. Here's a video where she explains some of the muscles in the hand. Just in case you wanted to hear the pops too.... Here's a video, just for you! 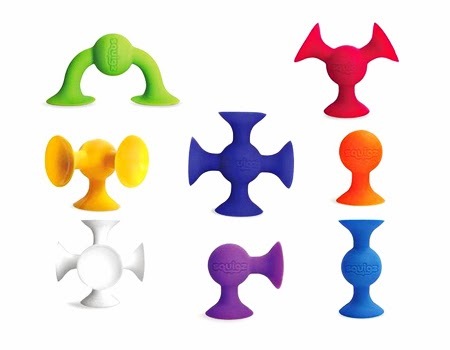 Reviewing Squigz is almost like reviewing a box of pebbles. There isn't much to say except that I feel great holding it, I can wash it, it's BPA free. I don't want to give you any ideas because I feel like it is good to be one with your Squigz and have no outside influences. It's not about coming up with something original. I think it's about sharing what you come up with so that you can connect to someone in a completely different way. If you look at these and gasp at the beauty but then wonder how much mileage you'll get out of them, you need not worry. This is plart. Twig is a very interesting toy. When I look at it, I'm immediately entranced. The colors are gorgeous and even without touching it, I know that it will feel gorgeous too. But what do you do? They kind of don't interlock. There not stable that way. 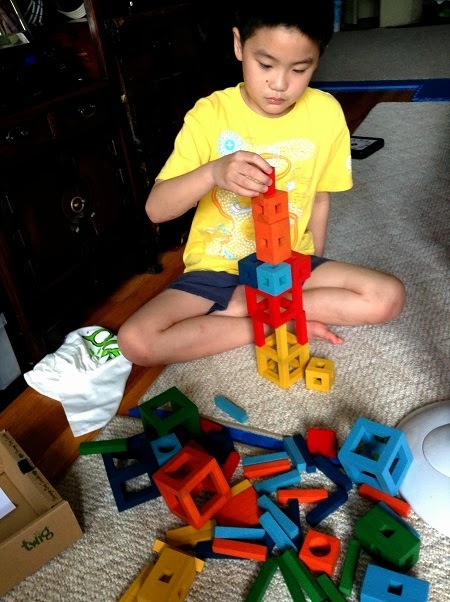 Do you build a tower? A robot? A bridge? This is what Twig taught me: HUSH. The value of plart is immeasureable. Let them do what they want. And if I may humbly suggest, I'd like you to do what you want with it too. This is a toy for the family. 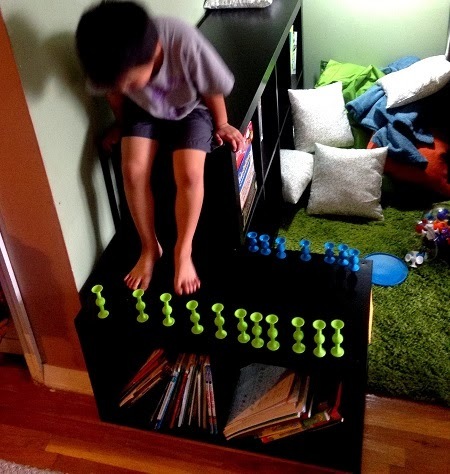 (think "family games") They are not things to step on by accident or to sit in at the bottom of a toybox. If you do something with them you don't have to put them away. You can put them on your family's display mantle next to the picture of Grandpa and Grandma. It's play, it's art. It's plart. One thing I've learned since I started Toys Are Tools is that plart is emotional food for the family. It feeds not food but it does feed our senses. It's something that you can do together or do alone to share with each other. 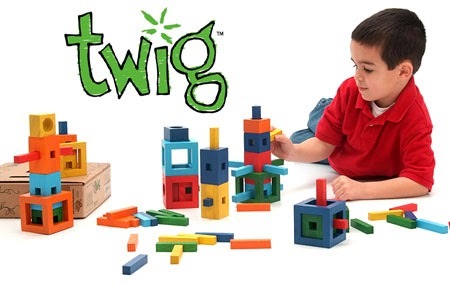 The design of Twig makes it very difficult for whatever you make to not be "art." Twig is so very pretty that way. Twig is beautiful even before it comes out of the box. He just must do this -All The Time. He is the messiest kid but not with this. as you can guess... we never use that bag. It is a great bag though. I've been told that Twig has won the Slow Toy Award. 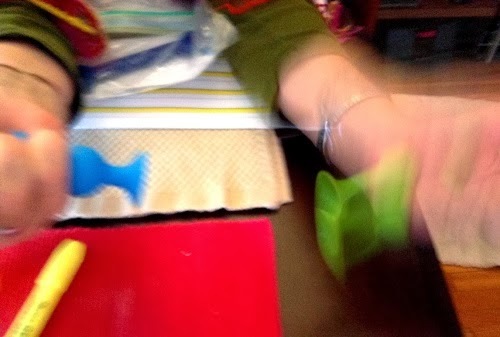 While I'm not wholly clear on what slow toys are, I know what slow food is since my family was in the food service industry for my entire childhood and more. We want to savor all the moments of the process: the making, the tweaking, the serving, and the enjoying. I think we want that for our families too, not just with food but with play too. But let's be clear, not every toy can inspire slow play just like the way that not every food can naturally bring out slow enjoyment. To be sure, Twig allows us to bring out the grace inside us. I think it's because they are so delicate and so beautiful. I am just guessing though, it's really all about what they think so as I said before, I'm going to hush up and just let them play. You can see the "slow" here. I would like to see more "slow" in my house, wouldn't you? 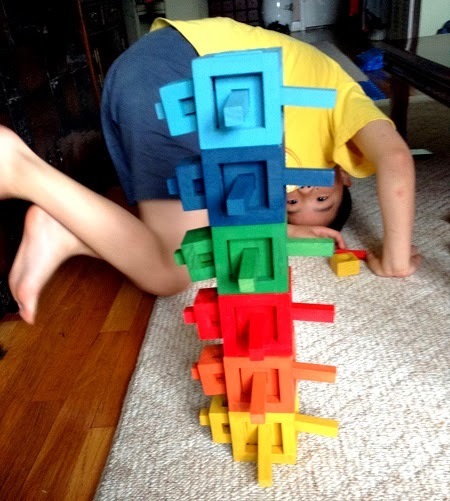 This kid looks at everything upside down. I wish books came upside down. 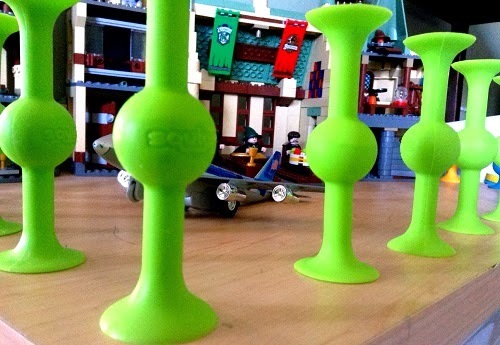 And now try to win the Squigz Set of 24! Warning: This container carries smiles that may be contagious. Seek a professional if you don't smile right away. Just fill out the Rafflecopter form below to enter to win! OOOH, I don't want to alarm you but I'm quite certain that the large shipment of Deluxe Squigz packages that just came in (got an email 11/14/13) will go out of stock very very soon. If you need some more motivation, here's a fact. Guess what's on my guys' Santa list this year: More Squigz those greedy little.... ahh... it's okay.. I want more too. 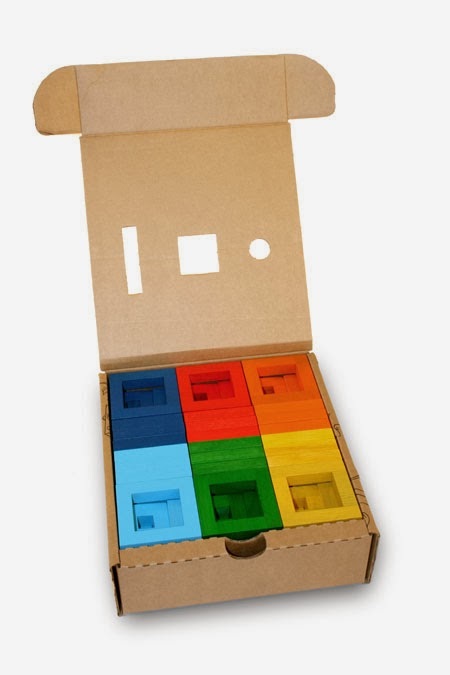 Fat Brain Toys has shipping for only $3.99 flat rate! And if you are a jungle shopper then here are the links to support Toys Are Tools! Thanks in advance. 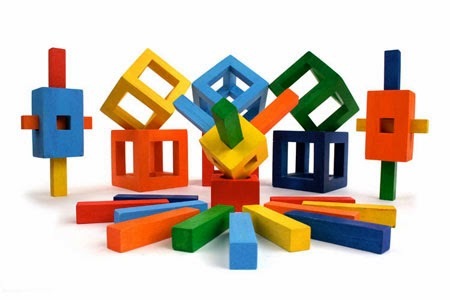 I also have links to my affiliate partner Red Hen Toys which offers competitive prices, excellent array of only amazing toys, and dependable customer service. My little grandson would love the PlasmaCar! Jack would love the Chromatics Set! So cool! 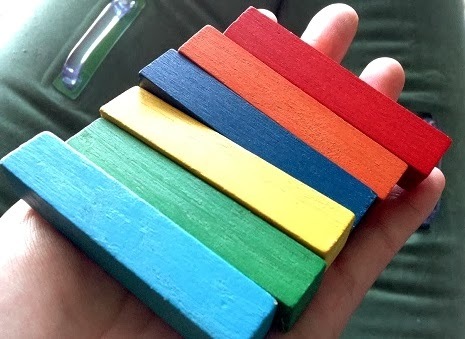 Also adore the classics, like these wooden building blocks. that thing scares me. I just bought the perplexus twist today. I think I played with it at the Toy Fair for the longest time! I have never played with them but they do look terrific. Color is awesome. We've never tried that one. It's looks like learning about physics in a very physical way. Very cool. You have my deepest respect. I would never go near that thing. 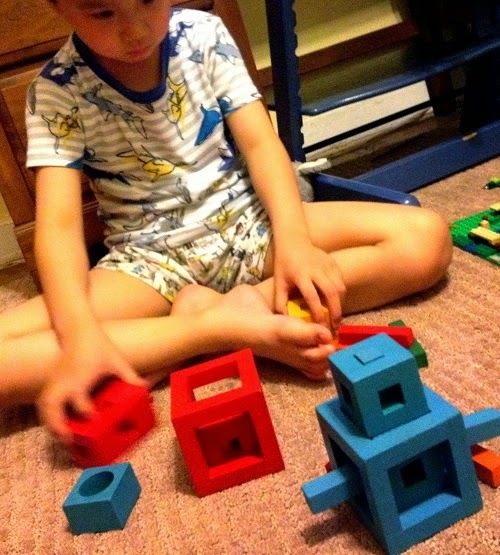 My son had a classmate last year who did every product in the Perplexus family. Stayed up nights trying to complete it. I think that's superhuman. 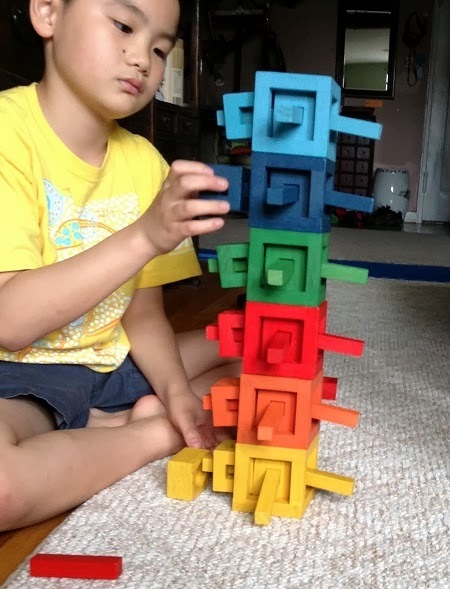 One of my sons loved bristle blocks. these updated colors look awesome. Yes, I like that this ride on toy is child propelled - great exercise and they are in control!